Here is a good story with a good ending. A couple of years back I met a fellow named Phil Tauber and he was calling me because he wanted to record at my studio with his daughter Jerra. Phil plays the trumpet and Jerra is a singer, songwriter, and guitarist. Their plan was to do this cross genre CD that pulled in Jerra’s hard hitting vocals with Phil’s more jazz influenced trumpet playing. The project rocked strong and we had a horn section in the upstairs studio playing these cool lines against Jerra’s Gen-X vocal delivery. The highpoint for me was when they talked me into, or truthfully, allowed me to play a distorted guitar solo with a wah-wah pedal. Bebop intertwining with Jimi Hendrix, it was a full grind back to my roots! Many years lapsed and then a couple of months ago Phil and his wonderful wife Gayle popped into Dizzy’s to catch our group Pass The Drum. The music was working that night and at the end of the gig Phil and Gayle updated me on Jerra’s whereabouts. Turns out she’s getting married in a couple of months and the wedding is going to take place in Hawaii. “And by the way, would our band be up for flying over to play some samba for the festivities?” Hawaii is a one of my absolute favorite places and having the opportunity to take the band along for the ride made the deal that much sweeter. I answered yes. 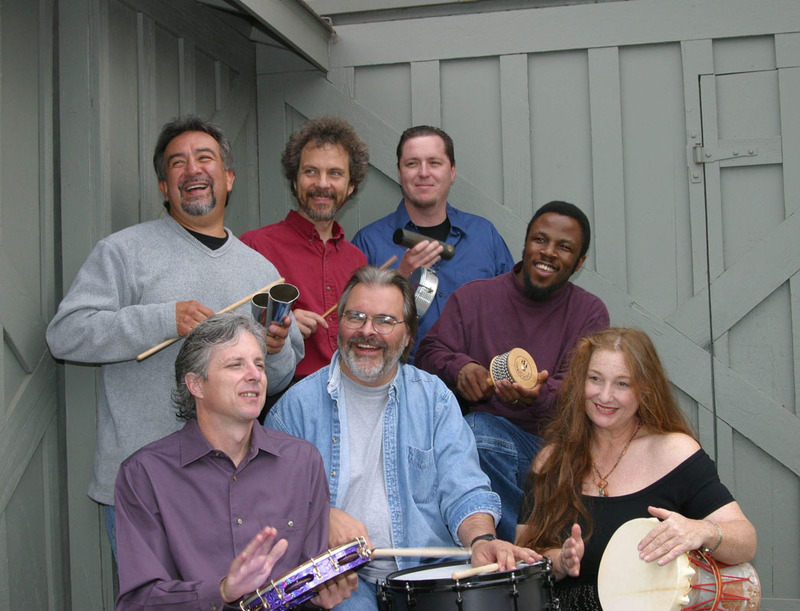 Pass the Drum with (left to right) Tom Aros, Ken Dow, Tripp Sprague, Leonard Patton, Duncan Moore, Coral Thuet and Peter Sprague. The name of the CD and the band is Pass the Drum. 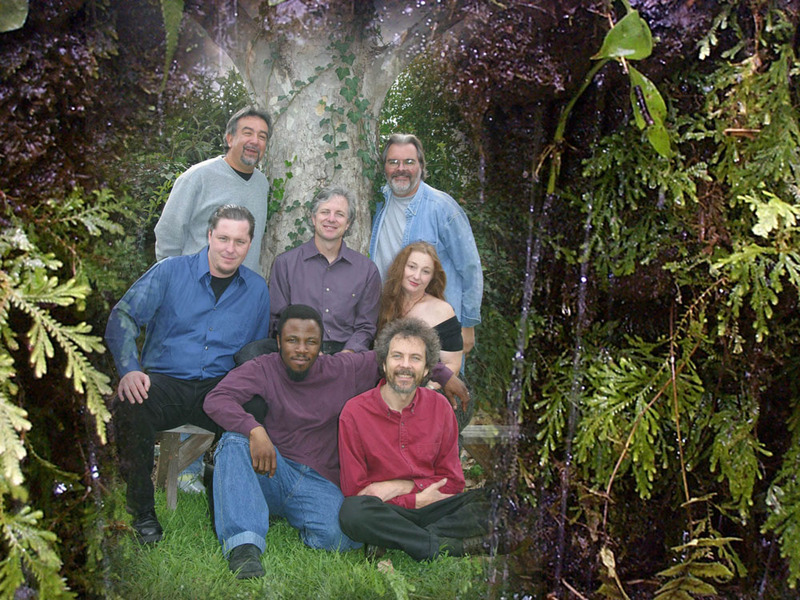 We are a seven piece group featuring Peter Sprague on the guitar; Tripp Sprague on saxophone, flute, and percussion; Ken Dow on bass; Duncan Moore on drums; Tom Aros on percussion; and vocals by Coral MacFarland Thuet and Leonard Patton. The name of our group evolved from an incident at Ki’s Restaurant back in 1999. We were getting ready to start the gig and rather than begin with the whole band playing all at once, we instead ventured off into a tan tan drum solo in which the drum was passed around to all members of the group. It was an invocation on what was to follow – music with a percussive core, an exploration into the magic and influence of Brazil, passing the drum and sharing the spirit of sound. The band grew from our love of Brazilian music, jazz, and elements of American pop music. As a young fellow I was absorbed in the music of Joao Gilberto and Stan Getz and from there discovered Djavan, Sergio Mendes, Caetano Veloso, and Ivan Lins among many others. Since the early days I’ve had different groupings of folks who had this same pull towards the samba. Earlier groups included vocalists Kevyn Lettau and Kleber Jorge, bassist John Leftwich, and horn players James Zollar and Lori Bell. Here are a couple of photos of the earlier incarnations of the band. 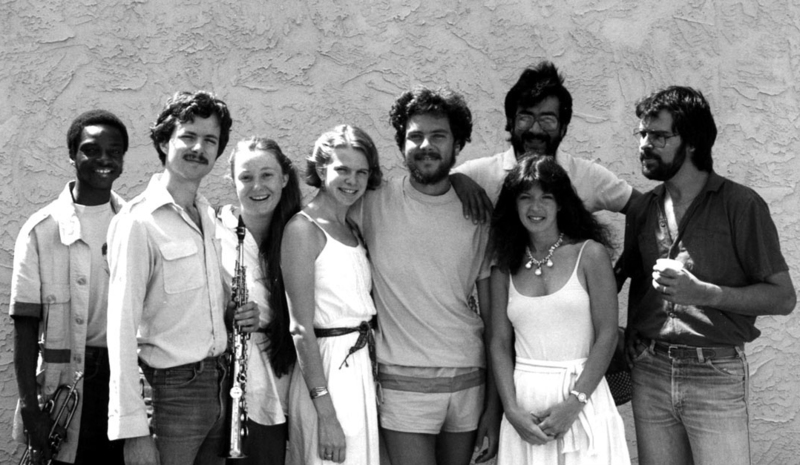 1980’s Band (left to right) Bim Strasburg, John Leftwich, Lori Bell, Peter Sprague, Tripp Sprague, Dianne Runolfson, Duncan Moore, and Tommy Aros. 1990’s Band (left to right) James Zollar, Tripp Sprague, Coral MacFarland Thuet, Kevyn Lettau, Peter Sprague, Deline St. Claire, Tommy Aros, and Duncan Moore. On this song, our approach is in the style of John Coltrane. I’ve changed the chord structure throughout the tune and in some areas I’ve expanded the rhythms. Coral sings this song. These are three of my favorite pieces composed by Brazil’s “Stevie Wonder”. Djavan is one of the best of Brazil’s new wave. Both Coral and Leonard are featured on these tunes. We’ve taken Marley’s reggae tune and put a whole new spin on it. The song lives in Jamaica for the first part and then launches into a double time burning jazz world for the solos. This song features vocals by Leonard. This is one of my favorite songs from the enormous and priceless library of the Beatles. I once heard Pat Metheny do this song solo and this served as the inspiration for our version. Leonard sings and I’ve changed the structure of the tune around to fit into a bossa nova ballad format. I’m a huge fan of Bruce’s music and this tune is one of my favorites of his. Bruce played it in his signature southern piano rock style and for our version we do the song in the style of samba-reggae. Leonard sings and the band soars. These are a couple of my original compositions. Both of these songs were written on a recent surf trip to an area north of Santa Barbara called The Ranch. It’s an exclusive surf spot where we camped with a lot of open space around us and surfed to our hearts content. I came up with these two songs and they feature the instrumental side of the group. 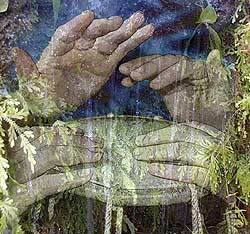 Water Tai Chi is an upbeat bossa nova and Six Circle is a tune set in the style of the Brazilian baiaio. This is a newer song by Jobim and features vocals by both Leonard and Coral. On this tune Jobim talks about the destruction of the rain forest from the perspective of a little bird searching for an answer. On this slow bossa nova Coral sings the story of a young fellow interested in a young girl and having all of the confusing thoughts that come along for the ride. He eventually realizes that he needs to follow the instinct of his heart, not his mind. This is song that I wrote about how I met my lovely wife Stefanie. We take Stings vision of the new world, set in the style of reggae, and launch from there. Leonard sings the lead and we all sing backups. I wrote a Chick Corea like interlude that finds us all turning up the concentration knob to pull it off. 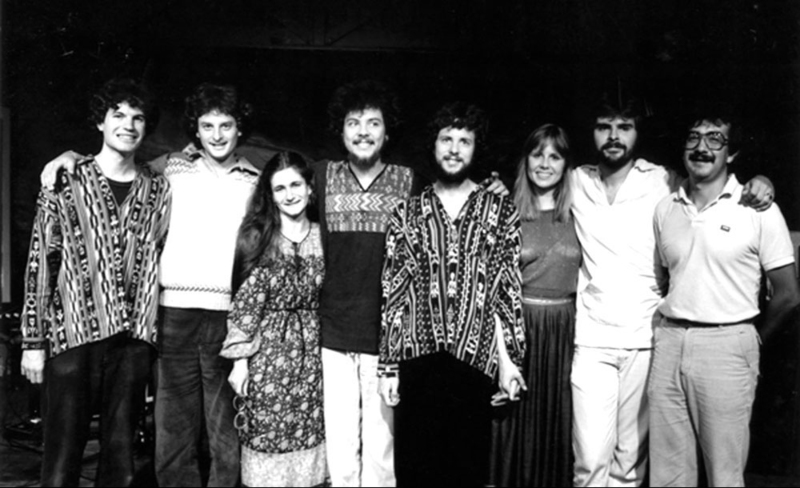 The current band with (left to right) Tom Aros, Tripp Sprague, Peter Sprague, Duncan Moore, Ken Dow, Leonard Patton, and Coral MacFarland Thuet. He has performed with Chick Corea, Hubert Laws, David Benoit, Charlie Haden, Sergio Mendes, and many others. Sprague has recorded fifteen albums under his own name and has lent his talents to over 120 other recordings, including the recent “Sombra” on the SBE Record label. Peter also is involved with producing many other artists. He runs a recording studio called SpragueLand and this is where you’ll find him leading the role of producer, engineer, guitar player, and arranger. In May, 2002 Peter composed and recorded the soundscore for a KPBS-TV documentary on artist James Hubbell entitled “Eye of the Beholder.” It has been produced into a DVD. In May 2002, Peter composed a twenty minute guitar concerto and performed it with the San Diego Symphony Orchestra. This was a big deal! Jazz saxophonist Tripp Sprague has performed and recorded music for over twenty years. Based in San Diego he has performed extensively with the areas top jazz musicians including singer Kevyn Lettau, bassist Bob Magnusson, and guitar players Peter Sprague and Steve Laury. Tripp‘s musical versatility has lead to invitations to perform from international acts such as jazz singer Mose Allison, and Motown legends Smokey Robinson, The Four Tops, and The Temptations. Tripp has recorded on numerous C.D.s with such artists as Kim Carnes and Todd Rundgren. Tripp also co-produced and performed on the self titled CD from the group “Blurring the Edges” which won the “best pop-jazz ” album at the San Diego Music Awards. Tripp also runs a recording studio from his home where he has produced and recorded CDs for numerous local artists. Ken Dow has played both upright and electric bass for over twenty years, earning a BA in Music from UCSD in 1995, where he studied with world-renowned bassist Bert Turetzky. Ken has toured all over Europe and the United States playing jazz, classical, funk, folk, hip-hop, soul, blues, bluegrass, rock and music that defies conventional classification, working with a vast array of distinguished artists including Brian May & Roger Taylor (Queen), Peter Sprague (Chick Corea, Al Jarreau), multiple Tony Award winner Des McAnuff (The Who’s Tommy, Big River), Patti Russo (Meatloaf), Jeff Scott Soto (Yngwie Malmsteen), and Chris Thompson (Manfred Mann’s Earth Band, lead vocals on “Blinded by the Light”), as well as sharing the stage with the likes of Steve Vai, Nuno Bettencourt (Extreme), Mike Keneally (Frank Zappa, Sting), Carmine Appice (Rod Stewart, Vanilla Fudge), Cliff Almond (Patti LaBelle, The Manhattan Transfer), Nick D’Virgilio (Tears for Fears, Peter Gabriel), Roy Hargrove, Sean & Sara Watkins (Nickle Creek), and Eric Marienthal (Chick Corea). Through his extensive theatrical experience, Ken has worked with international film and theatre stars Theodore Bikel (national tour of Fiddler on the Roof), Marilu Henner and Tony Award nominee Tom Wopat (national tour of Tony Award-winning Annie Get Your Gun), Grace Jones, Eartha Kitt, Jamie-Lynn Sigler (The Sopranos) and Billy Zane, as well as musicians Ray Manzarek and Robbie Krieger (The Doors). Duncan Moore attended the University of Iowa in 1973-1977, where he majored in music. He has performed with Joe Farrell, Conti Condoli, Mark Murphy, Hal Crook, Mose Allison, Art Neville, Carmen Bradford, Ray Brown, Sal Nestico, Tom Scott, Steve Kujala, Paul Horn, Buddy Collette, Bobby Shew and Rickie Lee Jones. Duncan is known for his ability to play at a high level in many different musical styles. He has performed on numerous national jingles and movie soundtracks. He has recorded extensively for the national Disney on Ice shows. Duncan has taught both privately and at San Diego State University. He has also been the guest artist and lecturer for many jazz camps and music clinics. Visit Duncan’s Web site. Tommy has been touring with Latin singer superstar Luis Miguel since 1995 and has recorded on the last two CD’s with him including the CD titled Nada Es Igual. Their tours have taken them throughout Mexico, the U.S., South America and Europe. The average concert has an attendance of around forty thousand people and up to seventy thousand people in South America. Tommy’s gear set-up for Luis’s tours include 2 congas, bongos, timbales, a toys table, and 5 cymbals. Tommy is a founding member of the band Fattburger, a international touring smooth jazz group based in San Diego, California. The group plays over 120 dates per year and has played in exotic locales such as Mexico City and Puerto Rico. The band has released seven albums, five of which are on the Intim- Capital record label . Their recordings have all charted in Billboard’s top-ten with the Good News album going to number #2. Fattburger has also been very successful on the other charts, with #1 listings on both the NAC and MAC charts. Capital-Blue Note released the Best of Fattburger on 5/15/92. Jazz and Latin singer Coral MacFarland-Thuet was born in San Diego, and raised in Tijuana, Mexico. She is a citizen of both countries. Coral is equally comfortable singing in Spanish, English and Portuguese. Her repertoire combines classical jazz and Latin American songs from Mexico, Cuba, Puerto Rico, Argentina, Peru and Brazil. Coral’s most current CD To Another Shore with guitarist/composer/arranger Steve O’Connor was released in April, 2000 and has been very well accepted and has received many excellent reviews and press coverage. She is currently recording a “live in concert” CD and a second CD with guitarist extraordinaire, Stephen O’Connor in which they include Spanish songs from Latin America, classical music and jazz. She recorded a CD with guitar virtuoso Peter Sprague “For All These Years” featuring the song she co-wrote Si Ya No Me Quieres Mas, 1st place winner of the 1992 Billboard Magazine’s song writing contest. Coral is also the featured vocalist on Jaime Valle’s most recent CD Third Voyage, winner of the 1998 San Diego Music Awards for Best Latin Jazz Album which includes one of her songs, I Remember Rio. In December 1998 and 1999, Coral performed at the San Diego Civic Theater with the 70 piece Navy/Marine Band at their annual holiday concert. She has performed at many jazz festivals as well as the San Diego Museum of Art’s Jazz in the Park series, Sushi Performance and Visual Arts Gallery, Teatro del Estado in Mexicali, Baja California, at the Miss Baja California pageant, Sherwood Auditorium, the La Jolla Museum of Contemporary Art, Centro Cultural de Tijuana, and many other clubs both in the US and Mexico. She has performed many live concerts on KSDS and PBS radio and has appeared on many television programs. One of Coral’s most memorable events was singing at two concerts for civil rights leader Ms. Rosa Parks. Recently she recorded the music for Disney on Ice and was chosen to sing the duet, “Beauty and the Beast” for the 2001 world-wide tour. In March 2001 Coral performed a “standing room only” concert at the Centro Cultural de Tijuana with the Orquesta de Baja California, conducted by Milan’s Pablo Varela. Coral has recorded on numerous albums and projects including vocals for Mexican superstar Luis Miguel and Andy Vargas, the vocalist for Carlos Santana. She also recorded a CD of Christmas music, Tidings of Comfort and Joy with pianist Randy Porter and two children’s albums in Spanish and English Don’t Wake up the Baby with children’s music star David Jack. Coral has recorded and written many national jingles and has sung for movies, television, numerous albums and for the 1996 Summer Olympics. Some of the other acclaimed musicians she has performed with include Kei Akagi, Mike Wofford, Bob Magnusson, Joe Diorio, Mike Garson, Kevin Lettau, Barnaby Finch, and Peter Sprague. Some of the places Coral has recently performed at in San Diego include the US Grant Hotel, Loews Coronado Bay Resort, Coronado Marriot Resort, The San Diego Museum of Art, the Museum of Photographic Arts, La Jolla’s Sherwood Auditorium and the Civic Theater. Some people are born to sing. Leonard Patton was just born singing. From his elementary school days when he requested hall passes in order to test the acoustics of the school’s hallways, to his college days of choir and ensembles, Leonard Patton was born singing and he has yet to stop. While attending Mesa Community College, Leonard discovered his musical niche for jazz. Leonard’s rich, smoky voice, unique style and sensational scattin’ soon gained him entrance into San Diego’s jazz scene. Since then this versatile vocalist has been performing and recording with such notable artists as Peter Sprague, Holly Hofman, Bob Magnusson, Jim Plank, Mike Wofford, Bill Cunliffe, Derek Nievergelt (Terence Blanchard), Duncan Moore, Kevin Hennessy, John Opferkuch, John Leftwich, Mitch Manker, Mike Bedard, Ken Dow, Rob Thorson, Chiara Civello, Jetro Da Silva (Whitney Houston, Stevie Wonder) and countless others. He then transferred to the prestigious Berklee School of Music in Boston, where he further developed his musical abilities and fed his passion for jazz. Finally, he finished his music training at Chapman University in Orange County where he performed in numerous concerts, recitals and jazz events. From Marley to Metheny, from Sting to Stevie – Leonard’s influences have been vast and varied; thus encouraging a unique style all his own. With an extensive collection of jazz standards and samba tunes at his command, Leonard has been singin’, stylin’ and scattin’ his way into the hearts of jazz and music lovers everywhere – born singin’ and yet to stop.